Every year around the holidays we hear a story about a Northeast Ohio family who won’t be able to enjoy their Christmas presents because they had a fire in their home that destroyed their gifts and their home. Sometimes there is a silver lining because they escape the calamity safely. Other times they aren’t as fortunate, and disaster claims a life. No one wants to think about that type of event happening with their own family. The good thing is a working smoke detector can drastically reduce the likelihood of your family falling victim to a damaging fire destroying your home. -Test your smoke detectors once a month. -Replace the batteries several times a year. A good schedule is to change the batteries when you change the time on your clocks. -Regularly vacuum and dust your smoke detector. -Replace your detectors every 10 years. These are some easy and basic ways to ensure that your family will be safe and sound this holiday season, and all year round. 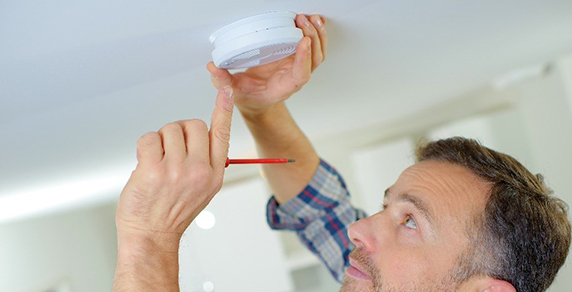 Do you need smoke detectors installed in your home or business? It can be hard, especially if you have high ceilings and don’t want to climb a ladder. 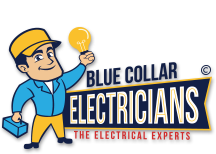 Let Blue Collar Electricians install your smoke detectors or have us come out to make sure the ones you have in place now are doing the job! Contact us today for a smoke detector install or evaluation.